There were some seriously amazing signs displayed at women's marches in the U.S., Canada and around the world. But leave it to legendary actor Ian McKellen to take the cake. Yes, that's an image of his BFF Patrick Stewartfacepalming as Captain Jean-Luc Picard from "Star Trek." The image continues to serve as the basis for countless memes that convey complete disbelief with the ridiculousness of someone or something. In note posted to Twitter, McKellen described participants in the march as expressing their reaction to the new U.S. president, "whose name in schoolyard English means to 'break wind' appropriately." The British actor criticized the "charade" and "schtick" by Donald Trump and his billionaire friends: "No doubt his believers will be soon disillusioned. The rest of us cannot let him reign unchallenged. The marches worldwide were a good beginning." 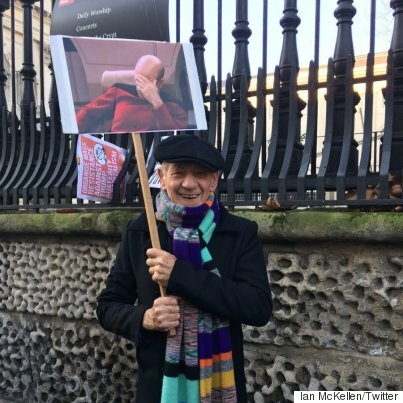 McKellen said that he actually found the facepalm sign in Trafalgar Square at the end of the march. McKellan has played major Shakespearean roles and is better known to contemporary audiences as Gandalf in "Lord of the Rings" and Magneto in "X-Men" franchises.